Be captivated by the rich heritage of Southeast Asia. Admire glorious wonders left by the ancient kingdoms of Thailand and Cambodia. Explore vestiges influenced by French colonization in Laos and Chinese dynasties in Vietnam. Experience how the region’s traditions still are an important part of present day life. Upon arrival at Bangkok Suvarnabhumi Airport, be met and greeted by our the guide and transferred to the hotel for check-in. 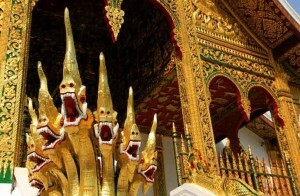 In the afternoon, head to Grand Palace, one of Thailand’s most acclaimed attractions. Explore this impressive complex of temples, palaces, pavilions and museums. One must-see attraction is the enchanting Emerald Buddha, which, according to legend, is almost 2,000 years old. After the Grand Palace, continue to nearby Wat Pho – Bangkok’s oldest temple and, arguably, it’s most impressive. Home to the magnificent 45-metre-long reclining Buddha, Wat Pho is also a place of learning, having served as Thailand’s first school of traditional medicine and Thai massage. OPTIONAL ACTIVITY: Enjoy a cocktail at Sirocco Sky Bar, Lebua State Tower. Sirocco Sky Bar Lebua has several reasons to turn minutes into timeless moments. Suspended in the sky on the 63rd floor of The Dome at State Tower, the Sky Bar is one of the world’s highest open air bars, overlooking a panoramic view of Bangkok and the Chao Phraya River. With such an enthralling ambience coupled with a seductive selection of the finest vintages, beverages, cocktails and appetizers in Bangkok, the Sirocco Sky Bar soars as one of the prized destination in the city. Note: Smart-casual dress code enforced. (EXO Travel can make the table reservation only, extra cost paid directly by guest). Depart from the hotel in Bangkok and drive directly to Bang Pa-In, the summer palace built by Rama IV. There, see the contrasting palace buildings and surrounding temples inspired by European, Chinese and Thai designs. Also visit Wat Niwet Thammaprawat, the gothic-inspired temple on the banks of the Chao Phraya River. After the visit, board the Thanatharee Rice Barge at Wat Kasatra Pier, and enjoy a private lunch cruise on the Chao Phraya River. En route, enjoy beautiful views of Wat Phanan Choeng, the Elephant Kraal Pavilion and local lifestyles on the riverside. Arrive at Ayutthaya. Surrounded by river and canal, this ancient city flourished as the capital of Siam from 1350 until it was sacked by the Burmese in 1767. The remains of the temples and ruins of this great city have now been declared a World Heritage Site. Disembark at Wat Kasatra Pier and visit the most important of the ruined temples in Ayutthaya Historical Park: Wat Yai Chai Mongkol, Wat Phra Sri Sanphet, Wat Mahathat and Wat Chai Wattanaram. 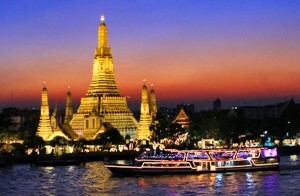 After checking out this famous historical city and snapping some photos of its ancient relics, return to Bangkok by car. This morning after breakfast meet with the guide and walk to Talad Noi, a great little neighborhood that’s been doing its thing on the riverside for a few hundred years. It has a cool mix of old family houses, leftover buildings from glory days past, markets and temples. Visit the nearby art and culture street to get a real feel for this hidden treasure of Bangkok. In the afternoon, transfer to the airport for an afternoon flight to Siem Reap. Welcome to Siem Reap, the charming gateway to the famed Temples of Angkor. Be greeted by the guide and head to the hotel for check in. Settle in and enjoy some time at leisure to refresh. In the afternoon, head out to explore some Angkorian ruins. 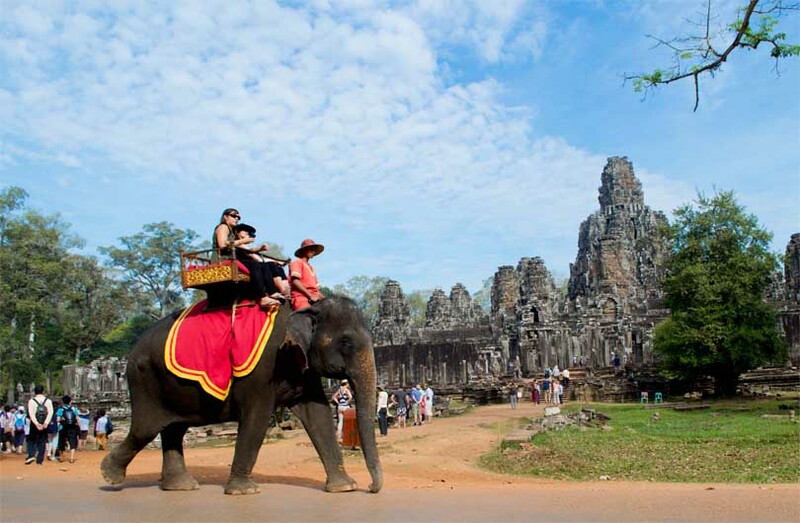 First, visit the massive temple complex Angkor Thom. Surrounded by an 8-metre-tall wall, the entrance to the complex is through an impressive stone gate carved with Elephants and four giant faces. On each side of the entrance path there’s a row of 54 gods or demons holding a sacred Naga snake. Continue to the Bayon Temple in the exact center of the city. This 12th century masterpiece is a study in grandeur and is well-known for its 54 towers with enigmatic faces representing the 54 provinces of the Great Khmer Empire. In the late afternoon enjoy a relaxing cruise in a gondola paddle boat at the moat of Angkor Thom compound while watching a spectacular sunset at Prasat Chroung Temple. Cocktails, champagne, canapés and a soft drinks will be available to enjoy on as the boat paddles slowly along the moat. In the evening, enjoy a welcome dinner at the incredible Chanrey Tree. One of the best fine dining restaurants in town, Chanrey Tree offers traditional Khmer cuisine in a lush contemporary setting. Located on the riverside in heart of Siem Reap, Chanrey Tree combines the amazing taste of only seasonal traditional Khmer ingredients, with a relaxed but lavish environment to provide a unique Cambodian dining experience. Start the day with a tour to the temples of the Small Circuit in Angkor by local ‘remork’ (similar to the Thai tuk tuk). The most illustrious of these is Ta Prohm, built in the mid-12th to early 13th centuries. Ta Prohm is unique in that it has been left largely as it was found: overgrown by jungle trees and vines, with many parts of the temple having crumbled to the ground. This makes the ‘Tomb Raider Temple’ one of the most picturesque and memorable of the Angkor temples. The visit will also include Banteay Kdei, a Buddhist monastery from the late 12th Century, and Srah Srang, also known as the “pool of ablutions”. After returning back to Siem Reap to escape the midday heat, spend some time at leisure. In the afternoon, take a two-hour walking tour around Kompheim Village, a 20-minute drive from Siem Reap, which provides insight into village life in Cambodia. Learn about rice farming and see ox and buffalo while strolling through rice paddies, and interacting with locals. Visiting local homes for a firsthand look at how local villagers live. This village tour is part of a cooperative effort to aid the local community, so half the proceeds of the tour go directly to a village enrichment fund managed by HUSK, a non-profit NGO that works with communities to improve the lives of Cambodians. Finish the tour at the Village House. Here, sip a glass of wine or local beer and snack on canapés while enjoying sunset over the rice paddies. After breakfast in the morning, head out to the countryside to see the “gem” of the Angkor area, the pretty temple of Banteay Srei. The so-called “Citadel of the Women” remains the best-preserved temple in Cambodia. It displays some of the finest examples of classical Khmer art as this small temple is noted for its truly remarkable fine bas-reliefs. Banteay Srei is unique in that it is constructed of pink sandstone, which is seen nowhere else in Angkor. Continue north to Kbal Spean, one of the earliest Hindu pilgrimage sites in Cambodia. A short 3 km trek up the hill through dense jungle is rewarded with a remarkable sight of the “River of 1,000 Lingas”, with some remarkable stone carvings of Hindu gods, animals and other symbols in the river bed. During the rainy season, enjoy a refreshing bath in the waterfall, which is extremely popular with the local families. After returning from the trek, be welcomed with a succulent Khmer picnic lunch. On the way back to Siem Reap, stop at the Landmine Museum which promotes mine awareness. Mr. Aki Ra, the museum founder, was trained as a child soldier during the Khmer Rouge regime and is working today as a de-miner. The museum serves also as a rescue centre for a number of landmine amputee children that Aki Ra has brought off Phnom Penh’s streets or from impoverished rural communities. On arrival back in Siem Reap, continue exploring Angkorian temples. Built during the reign of King Suryavarman II in the early 12th century, Angkor Wat is constructed following the model of the temple mountain symbolising the Mount Meru, home of the gods. The divine residence of Vishnu, the King himself was to reside here after his death. Inside the temple, the walls are covered with stone carvings and bas-reliefs depicting Hindu mythology and the wars Suryavarman II fought during his reign. Moreover, Angkor Wat is well known for the more than 2,000 Apsara dancers decorating the temple. Construction is thought to have taken around thirty years of intensive labour. Angkor Wat is figured on Cambodia’s national flag. The visit coincides with the ‘Golden Hour’ the perfect time to take amazing photos of the temple. Finally, the night ends with an incredible performance of ‘Phare, the Cambodian Circus’. Starting at 20:00, professional artists of Phare Ponleu Selpak (PPS) perform an inspiring show suitable for people of all ages. Set up in Battambang in 1994 by young returnee Cambodians from the refugee camps who learned how to use art as a means of coping with trauma, PPS has played an influential role in promoting and developing Khmer culture over the years after the Khmer Rouge genocide. The hour-long show mixes traditional and modern theater, music, dance, acrobatics, juggling and contortion performed in a story about Cambodian lives and society. Student performances can still be seen twice weekly in Battambang but now the circus has arrived in Siem Reap! In the morning, embark on an interesting boat trip on Tonlé Sap Lake for an opportunity to learn about life on the lake. Tonle Sap Lake is the largest freshwater lake in Southeast Asia and officially designated as a UNESCO Biosphere Reserve, covering an area of around 250,000 hectares in the dry season. Due to a unique phenomenon, when the monsoon begins, the swollen waters of the Mekong River force the Tonle Sap River to reverse its flow northwards, feeding the Great Lake and spreading over the surrounding floodplain. Return back to Siem Reap for an early afternoon at leisure to explore some of Siem Reap’s colourful markets before transferring to the airport for a flight to Luang Prabang, in Laos. After arriving, be met by the guide and driver and transferred to the hotel for an evening of rest and relaxation. Start the morning with a visit to one of Laos’ most picturesque temples, Wat Xieng Thong. Located at the end of the peninsula, close to the Mekong River, this temple was erected in 1560 by King Setthathirat and is deeply revered by Lao people. Walk to the boat pier, near the temple, and board the Nava Mekong, a beautiful wooden riverboat for a cruise up the Mekong to the Pak Ou Caves(depart around 10:30). The journey takes around 2 hours. Along the way, be surrounded by spectacular views, pass by small villages on the river banks and witness fishermen out for their daily catch. Upon reaching Pak Ou, disembark to explore the caves. 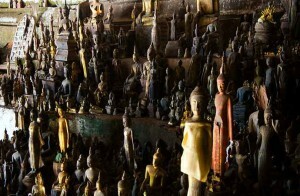 Here, see thousands of gold-lacquered Buddha statues crammed into two caves carved out of a towering limestone cliff. The statues range in size from a few centimetres tall to the size of a human, and the view from the mouth of the cave provides sweeping views of the Mekong and Nam Ou rivers. The caves are also a destination for local pilgrimages, especially during the Lao New Year period of Pii Mai, making them a great place to get in tune with local culture. Back onboard the Nava Mekong, cruise around the waters to a quiet location set amid limestone cliffs where the boat will moor for lunch. A selection of freshly prepared Lao dishes will be served before returning downstream to Luang Prabang. In the afternoon, have a chance to learn more about this culturally rich and history city with a guided tour. The city tour begins with a visit to the former Royal Palace, now the National Museum. Here, explore the history of Laos. Then continue on foot to Wat Mai, a temple renowned for its golden bas-relief, and Wat Sensoukarahm, which features a beautiful dazzling golden façade. Founded in 2002 in cooperation with the Institute of Cultural Research, the ballet aims to preserve Lao cultural heritage. Watching the spectacular performances of the Royal Ballet, including scenes from the Lao-Ramayana, Lao folk dances and tribal dances will provide a unique experience that won’t soon be forgotten. The show starts at 18:00 (Monday, Wednesday, and Saturday). Please note that the Royal Ballet Theater is normally closed from June to September. Today, gain historical and cultural insight into the rich architecture of the majestic UNESCO World Heritage Town of Luang Prabang with an expert who has lived in Laos for more than 20 years. The morning city tour with Francis Engelman includes four different types of buildings categorised by UNESCO. The first one is the traditional Lao house which is made from tropical hardwood or bamboo and built on stilts. The second is a half-wood and half-cement house built after the arrival of the French. The third is a traditional French colonial building similar to those found in Vietnam and Cambodia. The last form of architecture is the old Chinese shop houses that were built to be used for both commercial and residential purposes. Enjoy a selection of local favourites at one of the best Lao restaurants in town, Tamarind (Note: closed on Sundays). Then be driven through the Luang Prabang countryside to Kuang Si Waterfalls. Be sure to pay attention along the way, as the ride passes through a beautiful landscape of rice fields, hills and small villages. There are also viewpoints overlooking the Mekong River. Stop en-route to visit a small village which is home to one of the area’s many ethnic minorities. Here, have an opportunity to learn about their traditions and culture, much of which has remained unchanged for centuries. Upon reaching Kuang Si Waterfall, relax and enjoy the beautiful natural surroundings. The jungle and dense woods surrounding the falls is perfect for exploring on foot. For the adventurous, it is possible to walk to the top of the falls via a steep track where stunning views at the top. These waterfalls cascade down a multilevel limestone formation creating a series of turquoise blue pools perfect for swimming in on a hot day (Note: when bathing please be respectful, wear a sarong and be careful not to show too much skin). Before leaving, visit the bear sanctuary which is next to the falls. Run by Free The Bears Fund Inc., the facility houses 23 Asiatic Black Bears living in the sanctuary. The main threat to these bears is poaching due to the use of their bile in Chinese medicine. Learn about their habits and observe their playful nature, whilst learning about the difficulties they are facing and the conservation efforts underway to protect them. 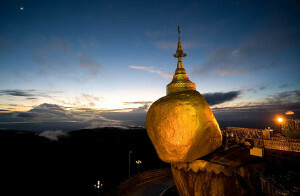 For early risers, there is a very special dawn visit to watch monks collecting alms. As the sun begins to rise, long lines of orange-robed monks leave their pagodas and walk barefoot down the streets collecting offerings from Luang Prabang residents. It is a beautiful, serene ceremony that highlights the spiritualism of the Laos people. Return to the hotel for breakfast afterwards. After breakfast, spend some free time at leisure. Meet with the guide and private car at the hotel afterwards and transfer to the airport for a flight to Hanoi, Vietnam. Luang Prabang – Hanoi QV 131, 1710-1810, subject to change without prior notice from the airline. Arrive in Hanoi and transfer to your hotel in town (note that hotel check-in time is 2pm). The rest of evening is free at leisure. Depart the hotel after breakfast in the morning for a visit the Temple of Literature. Built in 1076, The Temple of Literature was Vietnam’s first university and was established to educate Vietnam’s royalty, mandarins and members of the elite. The university functioned for an incredible 700 years. Its gardens and well-preserved architecture offer fascinating glimpses into Vietnam’s past. Next, visit Hanoi’s UNESCO World Heritage Site, the Thang Long Imperial Citadel. The Citadel was constructed on a Chinese fortress dating back from the 7th century and re-built in the 11th century by the Ly Viet Dynasty. The historical site and remains represent a unique fusion of traits, with influences from China in the north and the ancient Kingdom of Champa in the south. 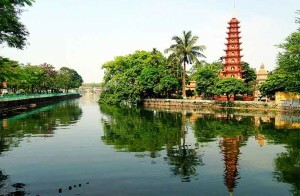 Afterwards, continue to Hanoi’s picturesque West Lake area and the sixth century Tran Quoc Buddhist Pagoda. From here transfer (or stroll along the lakeside) 700 metres to the nearby Taoist temple of Quan Thanh, dedicated to Tran Vu, one of the principal deities in Taoism. Next, visit Hanoi’s Old Quarter. Take a walking tour through the charming Hang Be Market and around Hoan Kiem Lake. This bustling area of narrow streets and alleys is home to literally thousands of small businesses and shopkeepers. It’s a great place to explore, with plenty of photo opportunities all around. Depart the hotel in the morning at 08:00 for the 2.5-hour drive through rural northern Vietnam to the site of Vietnam’s first capital, Hoa Lu. Visit temples dedicated to Emperor Dinh Tien Hoang of the Dinh Dynasty (968-980), and Emperor Le Dai Hanh of the Le Dynasty (980-1009). The ancient Hoa Lu Citadel, most of which has since been destroyed, once covered an area of three square kilometres. After visiting Hoa Lu, if time and energy levels permit, choose to take a half-hour walk up one of the surrounding limestone karst hills. The climb is rewarded with spectacular views. In the late morning, depart for Tam Coc Town to enjoy a Vietnamese lunch. Along the way, stop to take pictures of local villages and the stunning landscape. After lunch, visit Trang An Landscape Complex, a UNESCO World Heritage Site. Take a relaxing boat ride on a peaceful river passing through a series of caves. Trang An is a spectacular landscape of limestone karst peaks permeated with valleys, some of which are submerged, and surrounded by steep, almost vertical cliffs. As the boat gently slices through the water, notice the enormous limestone karsts jutting out from the green rice fields giving rise to other name, ‘Halong on Land’. Officially designated as an ‘eco-tourism’ area, the only interruptions here are the sound of birds and the gentle paddle of the oar upon the crystal clear river. For those feeling adventurous, there’s a climb up to Bich Dong Pagoda on nearby Ngu Nhac Mountain. The pagoda dates back to 1428 and is comprised of three structures: Ha, Trung, and Thuong Pagodas, in ascending order. After that, take a boat trip back by sampan back to Tam Coc Town. From there, transfer back to the hotel and spend the rest of the afternoon is at leisure. Following an early breakfast, leave Ninh Binh for a 4-hour (approximately) drive to Halong Bay, Vietnam’s most popular UNESCO World Heritage site! The name ‘Ha Long’ means ‘Bay of Descending Dragons’ and owes its origins to a Vietnamese myth. The towering limestone karsts represent the dragon’s back, surrounded by jade green water creating an unforgettable site. There are more than 1,600 limestone islands and islets with different shapes jutting out from the sea. Arrive at the Halong Bay jetty around noon and proceed with check-in formalities before boarding a boat for an unforgettable overnight cruise on Halong Bay. 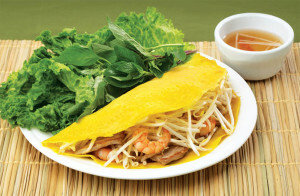 After being welcomed onboard, a lunch of Vietnamese food is served while cruising towards the bay itself. 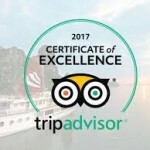 In the afternoon, enjoy some visits and/or activities (depending on each boat’s itinerary) or just spend some time relaxing on board. Towards the end of the day the boat sets anchor for the night among karst formations. Dinner is served on board. Wake to the sound of the sea gently lapping at the boat and be struck by the palpable sense of peacefulness whilst anchored in the middle of Halong Bay as the sun rises. After witnessing sunrise, breakfast is served (brunch on some boats). Enjoy the scenery while the vessel cruises slowly through the magnificent rock formations back towards the port. Mid-morning the boat will return to shore. Disembark and transfer to Hanoi Noi Bai International Airport to board a flight to the next destination.